Attention: The price vary according to specifications, please tell us the size and technical specifications, then we'll give you price. We also accept customization. EMF5000 series integrated electromagnetic flowmeter, Suitable for measuring the volume flow of conducting liquid and slurry in pipeline, Such as water, sewage, slurry, pulp, all kinds of acid, alkali, salt, food slurry etc., Applicable to the petroleum, chemical, electric power, metallurgy, water supply and drainage, light industry, food industry etc..
EMF5000 series integrated electromagnetic flowmeter using the latest technology in the world. Using constant current of three value low-frequency square wave or dual frequency rectangular wave excitation, Has both advantages of rectangular wave magnetic field, It overcomes the shortcomings of the sine wave magnetic field; It can eliminate the power supply voltage fluctuation, Error variation of power frequency and excitation coil impedance changes caused by; Zero stability and good and is not affected by the fluid noise interference. 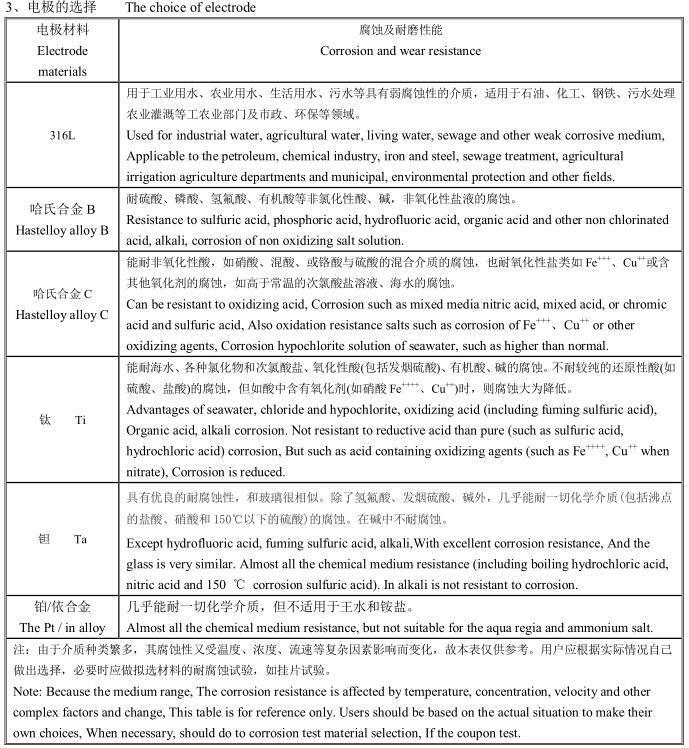 The product has high reliability, The characteristics of high stability. 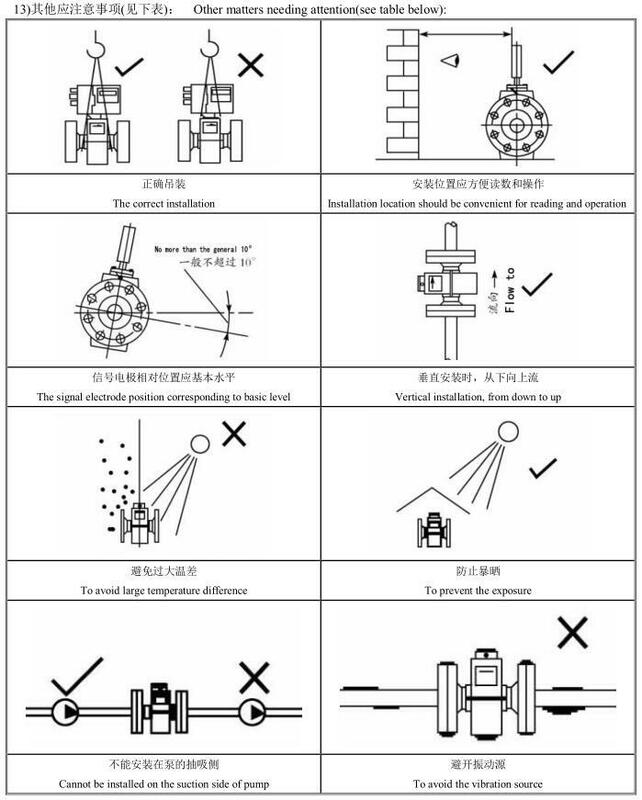 In addition, In this product the excitation coil designed with non uniform magnetic field distribution, The sensor made of small size and light weight, The error can be caused by the asymmetrical play a certain compensation. 1, the EMF5000 electromagnetic flowmeter has the advantages of simple structure,No rotary parts, So there is no friction, Long working life, High precision measurement, Reliable performance. 2, the sensor measuring tube without throttle and choke component, Therefore, no additional pressure loss, No blocking problem, Suitable for measuring the containing suspended matter, Solid particles, Two phase flow fiber etc. 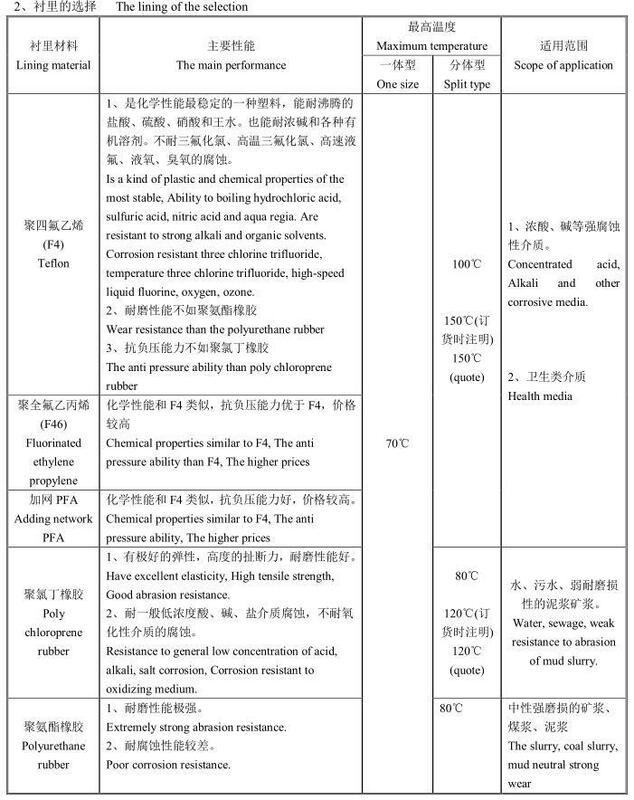 (such as mud, sewage, slurry, pulp, and viscosity of the slurry). 3, because the signal is formed in the magnetic field in full space, It is the average cross section of the pipeline, Therefore thus electrode plane to the sensor upstream the end plane straight pipe section with relatively short, Length of 10 × D (D is the internal diameter of the tubes). 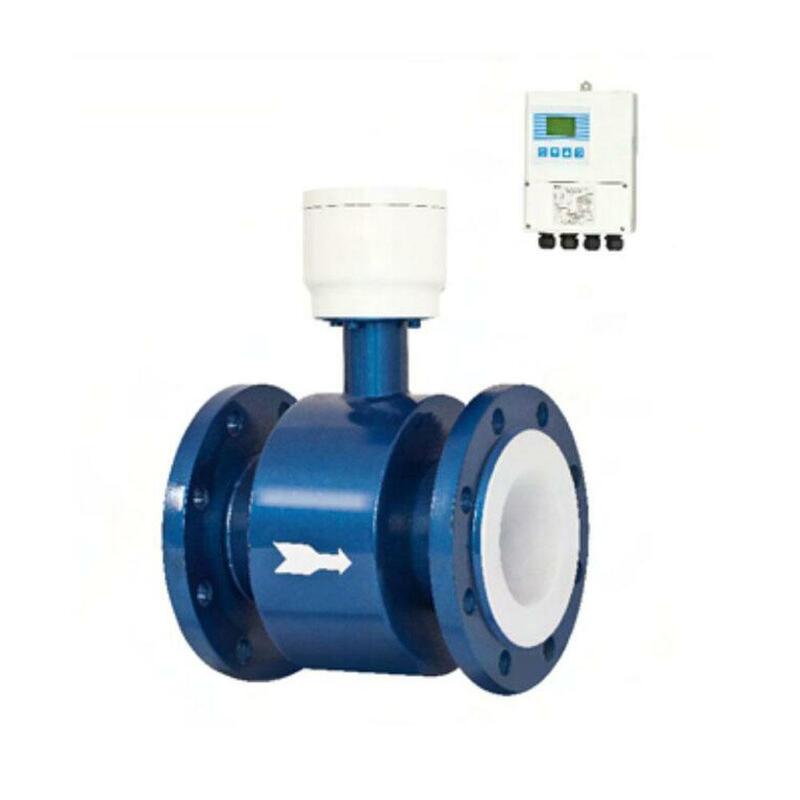 4, EMF5000 electromagnetic flowmeter without the mechanical inertia,Sensitive reaction, Measurement of instantaneous flow rate pulsation, Can also be instrument and unit, Computer matching the composition of a variety of automatic detection, Control system and control system. 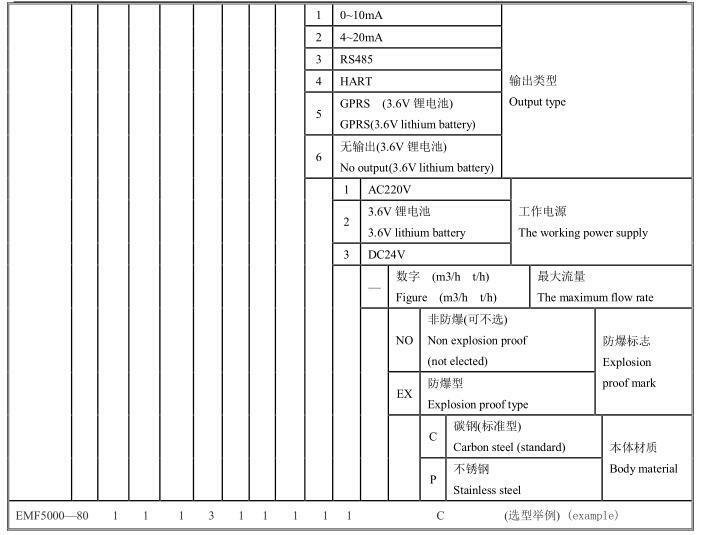 5, the output signal of the sensor is an exact linear relation with the average velocity of the electromotive force, And the measurement results and the temperature of the liquid, Pressure, density, viscosity, Conductivity (not less than the minimum conductivity) independent physical parameters, Such as water flow metering flowmeter calibration is also applicable to other media, No pressure loss without correction. 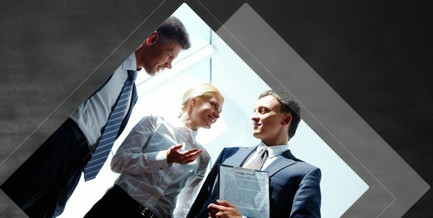 Therefore, high measuring precision, reliable work. 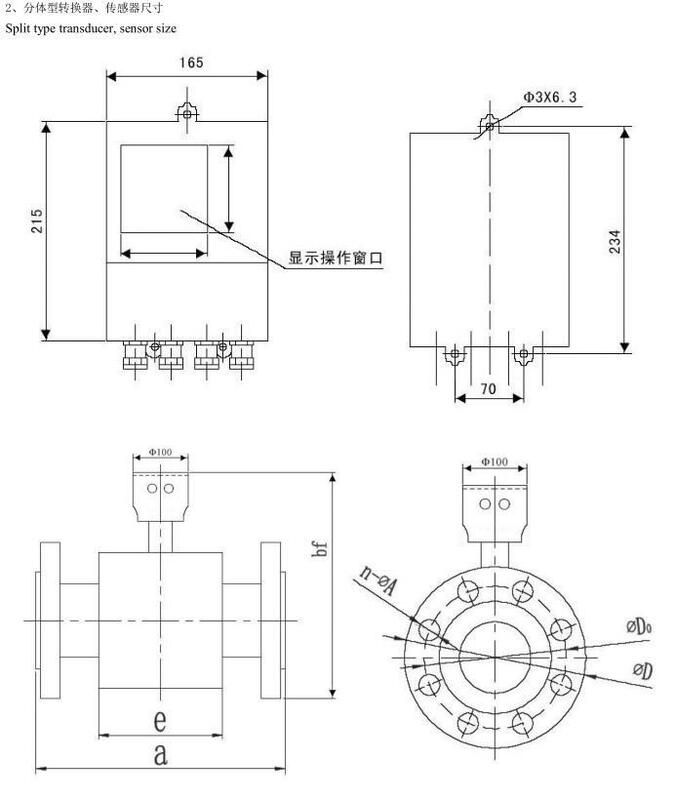 6, EMF5000 electromagnetic flowmeter with four electrodes, The built-in grounding electrode, For non conductive pipe without additional power connection ring. 7, at the same time with a 4~20mA current signal output, Pulse output and instantaneous flow alarm output, Another optional RS485 communication and HART protocol, 3.6V lithium battery GPRS wireless remote output. 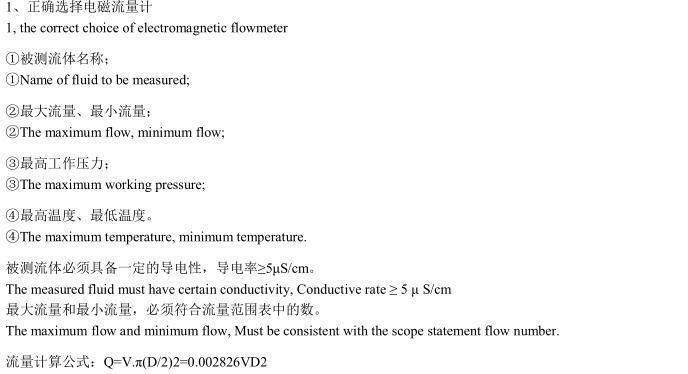 8, the site displays instantaneous flow, Percentage, Velocity, Positive and negative cumulative flow and total cumulant. 9, power supply AC220V, DC24V, 3.6V lithium battery. 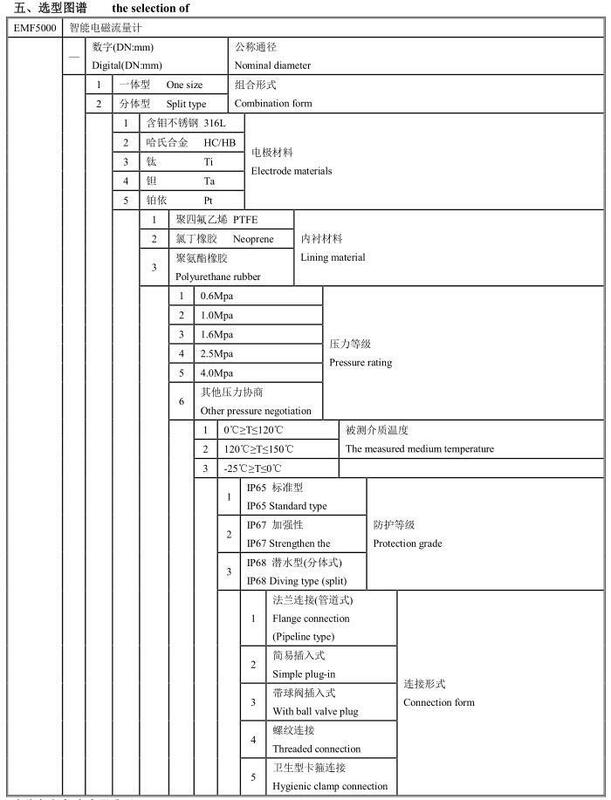 10, converter supports Chinese version and English version conversion settings. 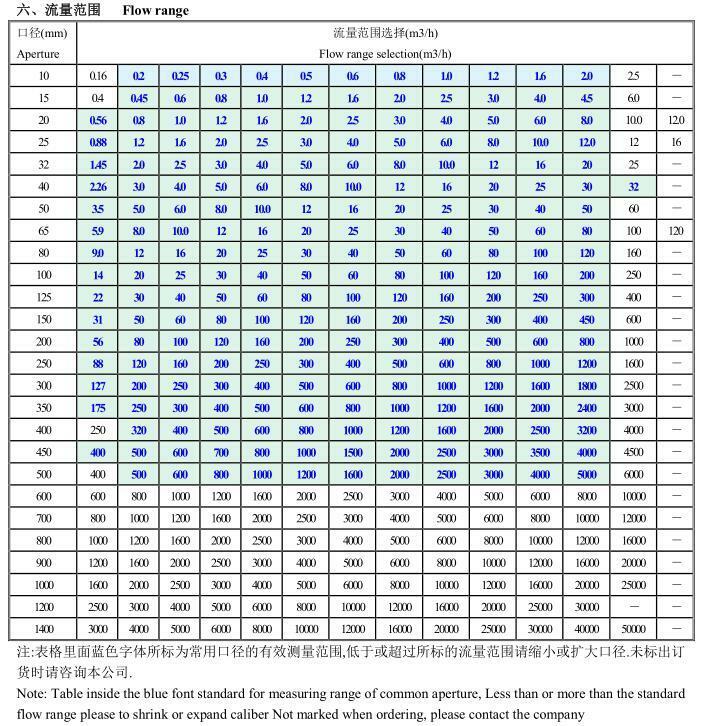 4,The selection of the measuring points should be far away from the high power station, strong magnetic field interference source. 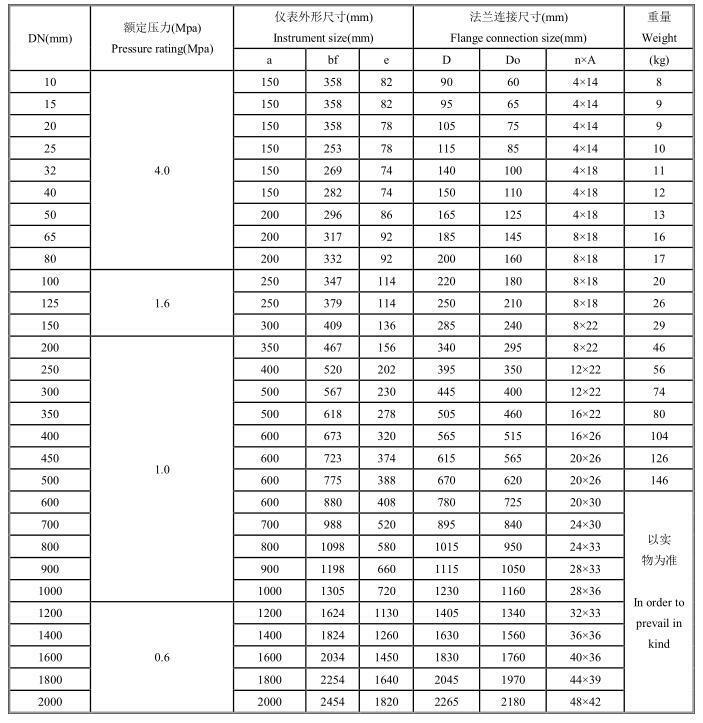 6,Flowmeter in front must have at least 5 X D(D meter diameter) The straight section length, The rear must have at least 3 X D(D meter diameter) The straight section length; In order to facilitate the installation and removal of, Can pipeline expansion joint installed in a flow meter. 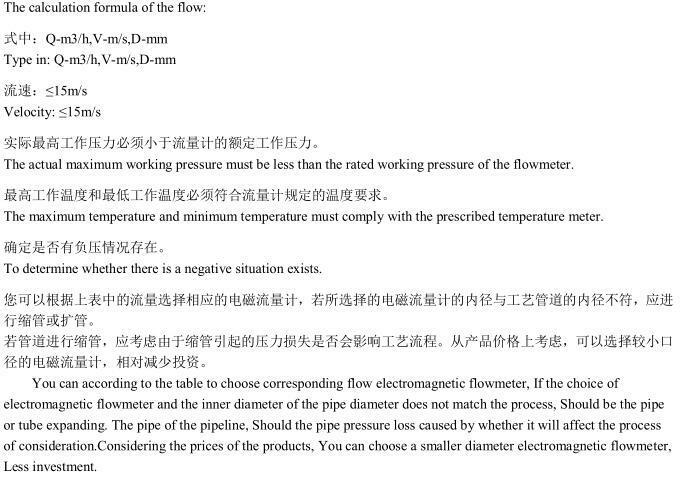 11,For the convenience of the flowmeter cleaning and maintenance, Should be installed bypass pipe, And to ensure that 3D straight pipe flowmeter before 5D. 12,Teflon lined flow meter installation, Bolt connection of two flange should pay attention to the uniform, Otherwise, easy to crush the PTFE lining, The best use of torque wrench.